If Rome had a do over, the architects would have made something like this. 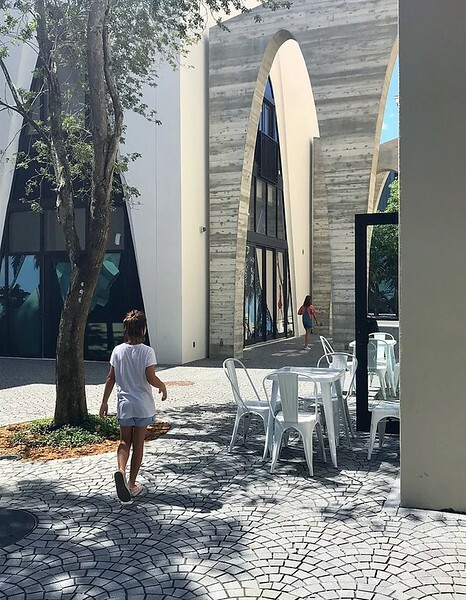 It’s not enough that the Design District visionaries at DACRA created a monumentally beautiful neighborhood with some of the most exquisite examples of building design in Miami. Phase two unveiled four new city blocks and this gorgeous alley, designed by architect Daniel Toole. 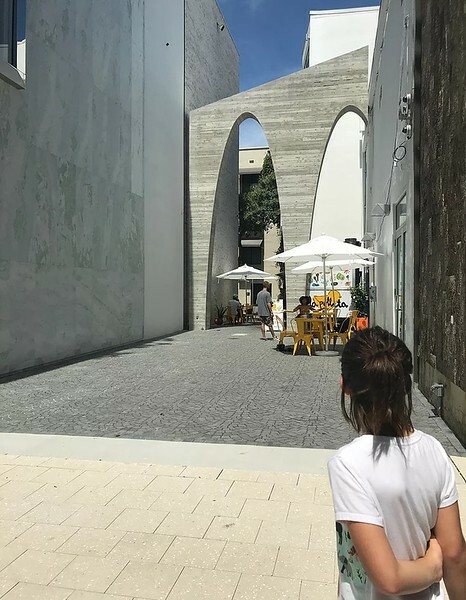 In many of my posts, I show examples of how other cities have brilliantly addressed some of the more banal aspects of their outdoor spaces– an attempt to inspire greater design here in my hometown–Miami. But in this post, Miami blissfully got it right. Let’s see how. Start with the entrance to the alley. A rather long block is cut in half with a pedestrian cut-through. Simple enough. 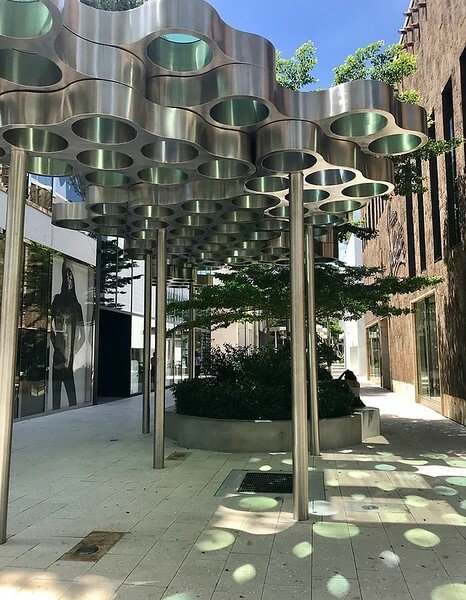 But DACRA upped the ante with this futuristic shade structure/sculpture designed by Bouroullec Brothers, which is so damn beautiful, you have to walk up to it to get a closer look. And just like that you’ve entered a new space. And for a real treat check out the “cladding” on this storefront above. It’s tree bark and it covers the entire two stories of this fashionable shoe store. A narrow opening reveals a glimpse of something completely different and unexpected. What’s clever are the layers of elements that convince the passerby to enter the space. (1) There’s a complete change in the pavement material and pattern. It’s laid out like an authentic Italian piazza. (2) There’s a tantalizing little food truck with something cool to drink and and a shady spot to sit. (3) But the biggest wow factor for me are the double arches. Here is a modern twist on the classic architectural motif. Modern because of the severe angle and the concrete material with a horizontal wood imprint. So stunning that it even wows children. 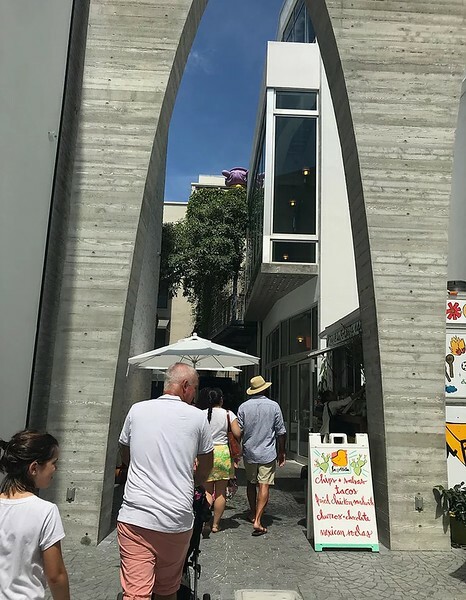 A closer look at the arch which frames the space beyond. And right by the food truck, the corridor narrows and the space is comfortable. 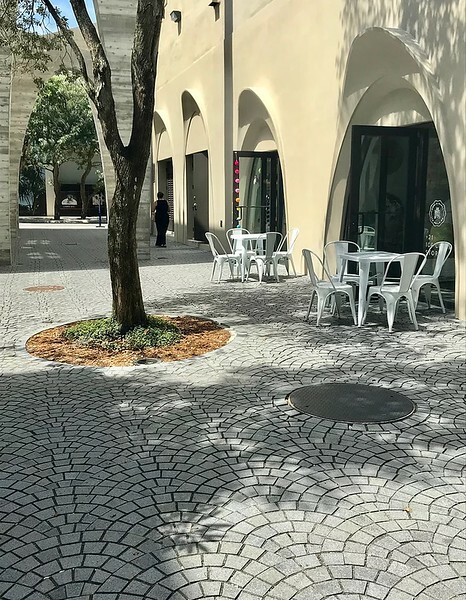 The swirling pattern of the paver stones is both quaint and elegant and just so unexpected in Miami. Maybe it was the staggering heat, but I felt transported to a different continent entirely. Beyond the arches is this charming flower stand which leads to one of the most spectacular flower shops I’ve ever seen. Flower arrangements suspended from the ceilings with impeccable detail. It was like a scene from William Shakespeare’s Midsummer Night’s Dream. No joke. I imagine in cooler weather more people will make use of the bench and chair. A little slice of paradise. Across from the flower shop the alley turns and opens up into a larger space. 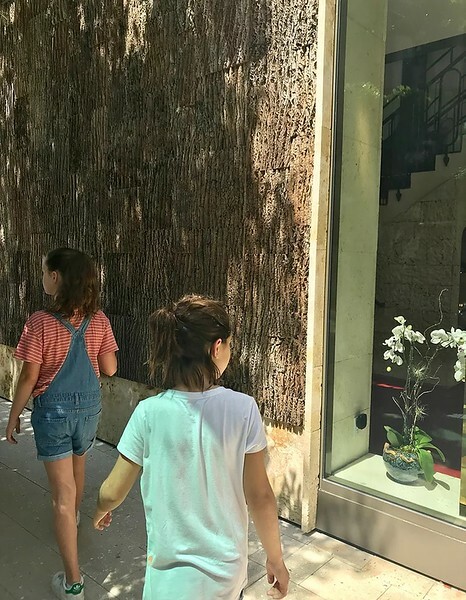 The shops here are well curated and sophisticated without being pretentious. 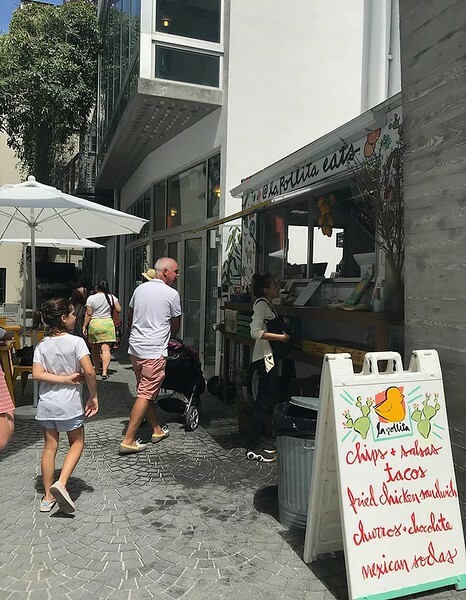 Oh, and there’s also an ice cream/gelateria because every chic European plaza has gelato. Now if only I could find the perfect cup of espresso and about ten degrees less heat. I think the temperature spiked to 96 degrees that day. I left wanting more. 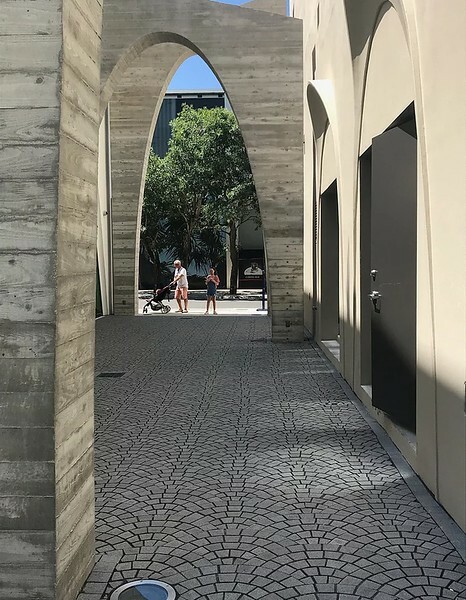 My only criticism, one gorgeous alley isn’t enough. But bravo DACRA. You succeeded in making a precious and simple space which is sophisticated and full of beautiful details. It’s a shining example of what our city can be. A modern interpretation of a classic city feature. 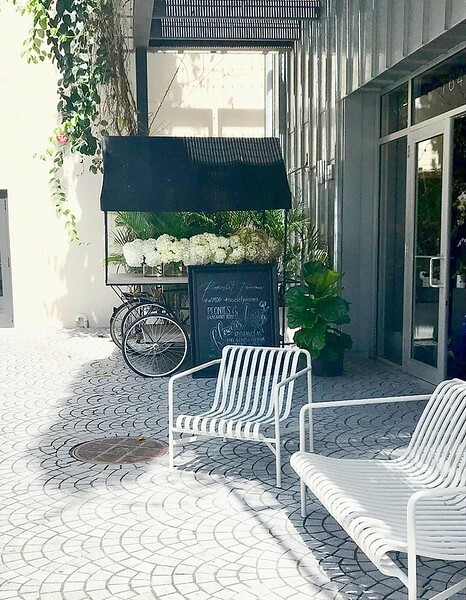 The alley is reborn in our very own Miami Design District.